Squarespace. Celebrating 10 years of making it fast and easy to create an exceptional-looking website! Get 10% off your first purchase at squarespace.com/twist. There was literally no program available to teach computational learning to kids past the age of ten…that is, until Ready was brought to market in February 2016. 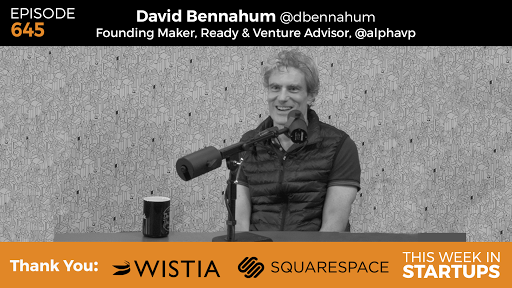 Jason sits down with Alpha Venture advisor and Ready Founding Maker David Bennahum in Episode 645 of This Week in Startups. David discusses the challenges of teaching coding to kids and shows off his software creator Ready, which aims to revolutionize the face of computational learning and education. Built on top of Unity 3D, Ready is an educational coding app for PC, iOS, and soon Android. David opens up the app and gives a step-by-step analysis on just some of the functionality of his program. In a nutshell, the idea is to make coding fun. It’s built to allow kids to basically code using visualizations instead of the boring command-line system of common script. In addition to the visual aspects of this coding system, Ready works on a sort of “if/then” set of commands where you can select an object and tell it to “Do” something “When” something happens. It is broken down and laid out to make it easy and fun for kids to build their own software. What is the impact of Minecraft on the platform that David has built? “Self-expression through creation and exploration of worlds and tools.” David explains the reasons for Minecraft’s success, in that humans have an innate desire to create, build, and explore, and Minecraft created a digital platform that allows for all of those aspects to be achieved by the user. Ready takes it a step further by actually teaching kids how to think computationally through building and creating new worlds. David believes that, “one of the pitfalls as a parent is this junk food phenomenon with apps, that apps are becoming industrialized the way food was industrialized to become junky and create addiction. And Ready is very much in opposition of that. It’s saying this is a healthy, organic digital activity… It’s Whole Foods for your brain.” So many apps that children are playing (i.e. Candy Crush and Fruit Ninja) are just mind-numbing, repetitive games that offer no real mental stimulation. The ‘gamification’ is addicting, and it is an issue that must be addressed in our society with thought-provoking digital substitutes. It has become clear that in order to be employable you MUST have a baseline of tech skills and computational awareness. The education system in America is vastly under serving the need for computer and software training. One possible factor, Jason believes, is that teachers may not feel confident enough in their own computer skills to teach it to their students. David agrees, and also foresees a potential issue for finding teachers who are well versed in software engineering. He believes that it will be very difficult to convince people to take downgraded pay to teach when they could make way more money working as an engineer at a tech company. Has the internet been stifled by social media? 1:01-2:28: Jason introduces his guest, David Bennahum of Alpha Venture Partners. David gives a brief intro to his new coding program, Ready. 2:28-5:25: The two discuss their experiences as being part of the first wave of kids who programmed on personal computers. 5:25-8:24: David explains his passion in life, which directly led to his current venture with Ready. 8:24-12:38: Jason asks David to give an initial demo of the product. 15:04-21:46: David surprised Jason walk down memory lane with an old issue of the magazine Jason founded in the 90’s, Silicon Alley Reporter. 21:46-27:15: David proceeds to go a little more in depth as he demos his software education tool. 27:15-28:39: Jason asks David how this program is different from Unity. 30:49-33:21: The two discuss the “magic” of Minecraft, and it’s impact on David’s Ready program. 33:21-34:40: David talks about the unexpected adoption of Ready by schools. 36:48-37:51: David talks about the importance of limiting access to digital media until kids have developed proper cognitive thought processes. 37:51-42:53: David explains the first video game gamification moment, Space Invaders, and the dangers of modern gamification. 42:53-44:02: David believes that Ready is a digital platform that is healthy for the human brain, not like the addictive, junk food sort of apps. 44:02-46:49: Jason asks about the business model for Ready. 46:49-49:03: The two discuss the ‘Digital Divide’ and the unequal access to code literacy in education. 49:03-53:56: David reverts back to explaining the model for revenue with Ready, and the motivation for school administrators to pay for the service. 53:56-1:03:55: The discussion turns toward the collapsing of a free and open internet. 1:03:55-1:07:45: David and Jason discuss early http protocol, and an alternate option for an internet payment system that never came to fruition, as well as the new trend of people being willing to pay for software services again. 1:07:45-1:09:39: David explains how he changed the way he uses Facebook, and it changed the way he feels about the tool altogether. 1:09:39-1:18:48: Jason wraps up the program by answering some questions from David about various stages of his career.